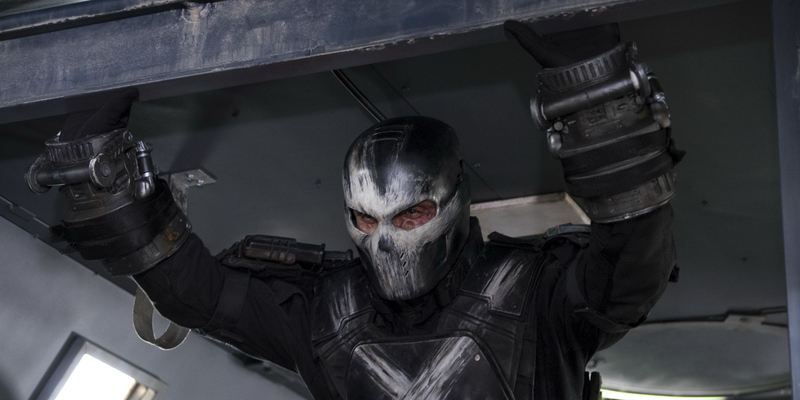 Could Crossbones Have Survived Captain America: Civil War? This summer's Captain America: Civil War had the most expansive ensemble ever assembled in a Marvel Cinematic Universe movie, pitting two teams of Avengers against each other. Of course, the heroes needed some villains to do battle with as well. While the main antagonist of the movie was Zemo (Daniel Brühl), the evildoer featured in Civil War's opening moments was Brock Rumlow/Crossbones (Frank Grillo), who had survived his encounter with Steve Rogers at the end of Captain America: The Winter Soldier. Unfortunately for those hoping to see the fan-favorite character become a recurring threat in the MCU, Crossbones met his demise shortly after the movie began. Detonating a suicide belt to eliminate himself and Captain America, Rumlow was thrown through the air by Scarlet Witch (Elizabeth Olsen), blowing up and killing innocent people inside of a building. Given Crossbone's key role in the Civil War comic (in which he assassinates Rogers), this felt like a disappointing waste of a strong character. But according to Grillo, he may come back yet again. "You think he dies, don't you? Did you see the body?... That happened last time. I'm not saying anything except that ... you didn't see a body." The MCU has become notorious over the years for employing fake out deaths, in which a character appears to be killed in a film, only to show up alive later on. As fun as it is to watch Grillo as Crossbones, the argument could be made that this would be taking things a bit too far. After all, Rumlow literally exploded in Captain America 3, so the filmmakers would have to bend backwards to explain the character's reappearance in a manner that makes logical sense. It's worth keeping in mind that typically the Marvel villains remain dead, so Grillo also has that bit of history working against him. Marvel's more occupied with keeping their protagonists (minus Quicksilver) safe, it appears. Grillo has signed the usual multi-picture deal with Marvel Studios and would be up for another go-around if asked, but that doesn't mean anything at this juncture. The longterm contracts have become standard business practice for massive Hollywood franchises, and the fluidity of the projects means that nothing is set in stone until the cameras are rolling. Hugo Weaving, who played Red Skull in 2011's Captain America: The First Avenger had a similar agreement and hasn't been heard from since. Depending on the direction of the franchise, there's no telling when a certain character will be required. Robert Downey, Jr. wasn't originally planned for Civil War, but renegotiated with the studio to join the cast. Marvel may know which films specifically they have coming through the pipeline, but the details can be in a state of flux. As such, those hoping to see Crossbones return on the big screen shouldn't hold their breath. Not only would it be a potential headache to illustrate how Rumlow survived a bomb, the upcoming films of the MCU's current phase all appear to have their villain roles covered by other characters. Whether we saw a lifeless body or not is moot; the circumstances surrounding Crossbones' death makes it near impossible for him to show up again, so it seems like his time in the franchise is over. Captain America: Civil War will be available on Digital HD, Digital 3D and Disney Movies Anywhere on September 2nd, 2016 and on Blu-ray 3D, Blu-ray, DVD and On-Demand on Sept. 13th, 2016. Doctor Strange opens in U.S. theaters on November 4, 2016, followed by Guardians of the Galaxy Vol. 2 – May 5, 2017; Spider-Man: Homecoming – July 7, 2017; Thor: Ragnarok – November 3, 2017; Black Panther – February 16, 2018; Avengers: Infinity War Part 1 – May 4, 2018; Ant-Man and the Wasp– July 6, 2018;Captain Marvel– March 8, 2019; Avengers: Infinity War Part 2– May 3, 2019; and as-yet untitled Marvel movies on July 12, 2019, and on May 1, July 10, and November 6 in 2020.